Instructor-led sessions, either in physical or virtual classrooms, play a big part of many organizations’ learning strategies. To support such initiatives, the best learning management systems (LMS) are equally adept at managing scheduled instructor-led events as they are at managing self-paced learning. If your organization delivers a large number of scheduled events, it might be tough for learners to keep track of what’s available and what might fit into their daily schedules. The ability to tag instructor-led sessions with keywords can be an elegant way to present learners with a manageable list of upcoming events so that learners can quickly assess whether they’d like to attend. When people think of tags, they automatically think of topic keywords. A course on, say, cardiopulmonary resuscitation (CPR), might be tagged with the topic keywords Health; First Aid; and CPR. 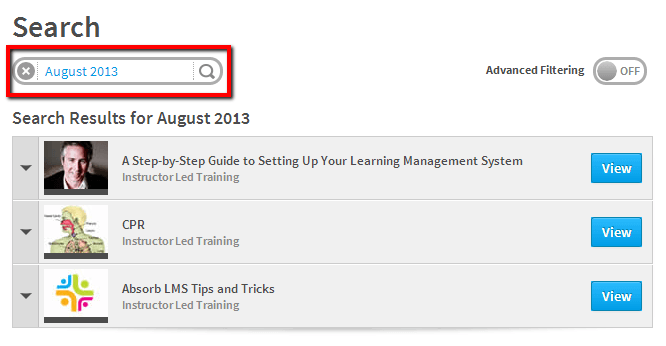 Since this course will be delivered as a scheduled instructor-led event, you can make it significantly easier for learners to find the session in their learning portal by adding a keyword to define the date range in which the session will be taking place, as well as a keyword specifying the name of the instructor delivering the session. NOTE: Peter Safar is credited to be the inventor of cardiopulmonary resuscitation (CPR). He passed away in 2003 but it seems appropriate that he be revived symbolically in this Blog post to teach this important topic. A learner clicking the August 2013 tag or searching for that keyword will be presented with all the scheduled events taking place in August 2013. Similarly, clicking the name of the instructor will present the learner with all the scheduled sessions being delivered by that instructor. If your organization has an in-house public speaking rock star with a reputation for delivering good content, your learners will appreciate a quick way to view all the speaker’s scheduled sessions. To maximize enrollment and attendance, it’s critical that learners be able to quickly find instructor-led sessions and other scheduled events in their learning portal. Tagging scheduled events with date ranges and names of speakers can make it a breeze for learners to find sessions of interest that fit their schedules.